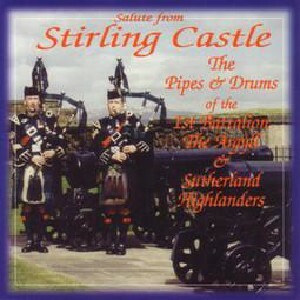 Salute from Stirling Castle, The Scottish Music Shop - The Best Selection of Scottish CDs and Scottish DVDs. 1999 recording by the Pipes & Drums, The 1st Battalion Argyll and Sutherland Highlanders. (Princess Louises) The Argylls have toured the world many times over the years and therefore this music should not be a stranger to lovers of good army pipe music. The programme was recorded under the auspices of pipe major Jim Motherwell, the Queens Piper, and it presents a colorful collection of Regiment and more popular (pop) tunes.